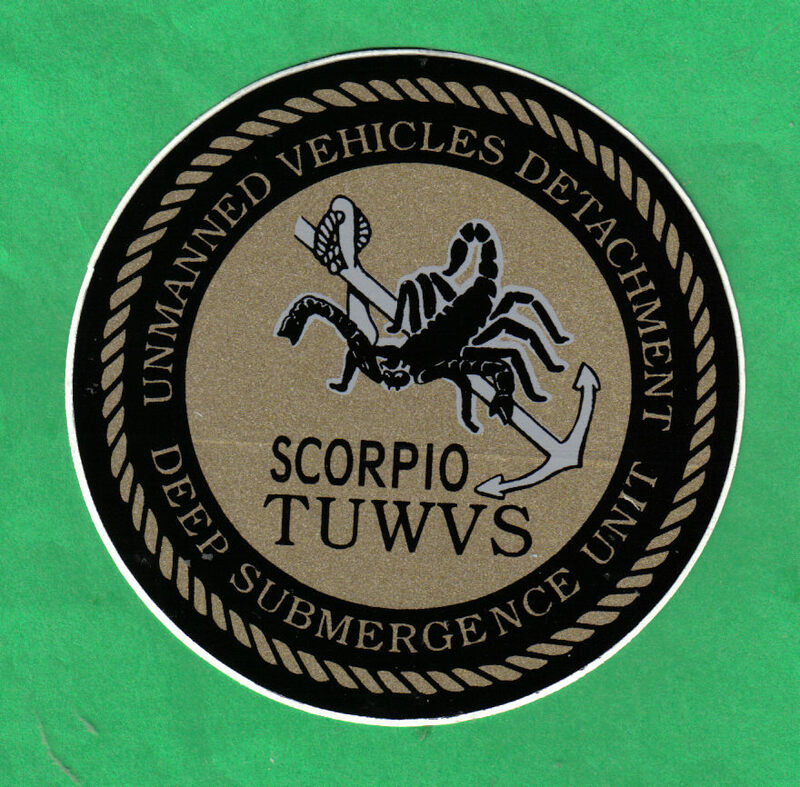 The Unmanned Vehicles Detachment (UMV) was initially organized in the mid 1970s from personnel in the various departments of Submarine Development Squadron 5 and Deep Submergence Unit. 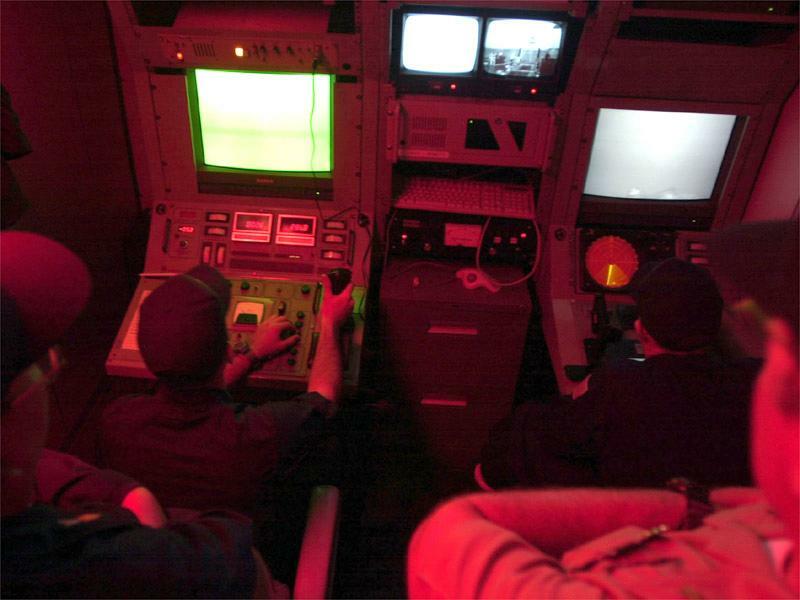 UMV was first assigned a Side Looking Sonar (SILOS) system and a precision navigation system. These systems allowed UMV to begin search and survey operations, mostly in shallow water and near land. As deep ocean ROV technology continued to develop, UMV continued as well. In August of 1987, the unit's recovery capability was further extended with the delivery of the Super Scorpio Tethered Unmanned Work Vehicle System. The Super Scorpio system, of which UMV has two vehicles, was an extremely advanced vehicle, capable of lifting far more payload than the RCV. UMV's final system was delivered in 1992, the Advanced Tethered Vehicle (ATV). 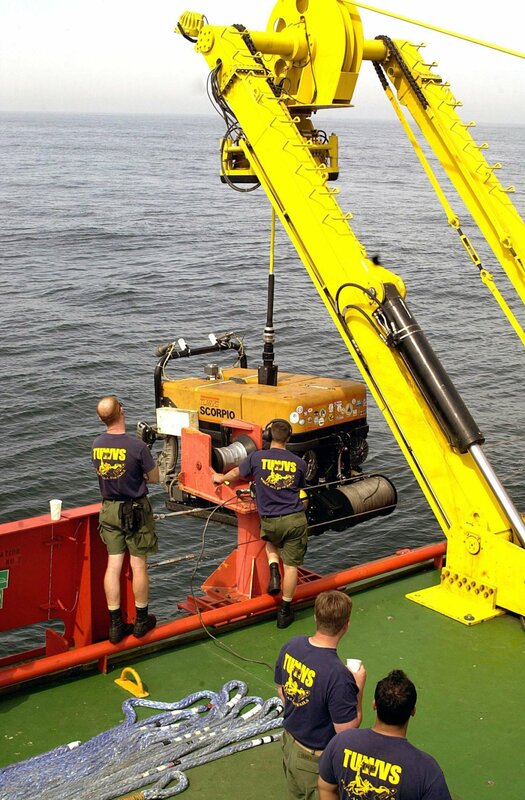 ATV is similar in design to Super Scorpio, but has a greater depth capacity and a fiber optic tether for more efficient data transfer between the ROV and its surface operators. 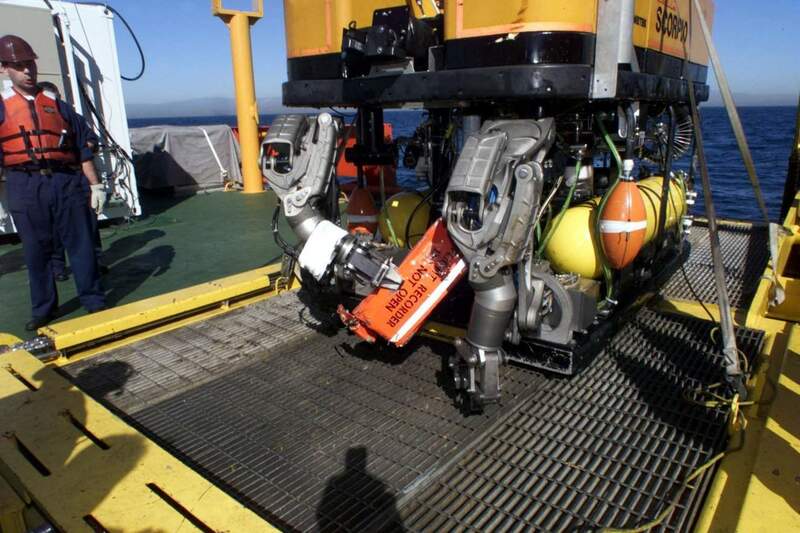 In recent years, the ROVs of Unmanned Vehicles Detachment have been responsible for the recovery of over 100 million dollars worth of military and civilian hardware. Also, the unit has been instrumental in the successful completion of various research endeavors by the United States' scientific community. UMV remains a flexible and potent asset, continuing to evolve as equipment becomes available. Two Manipulators Capable of lifting 250 lbs. each. 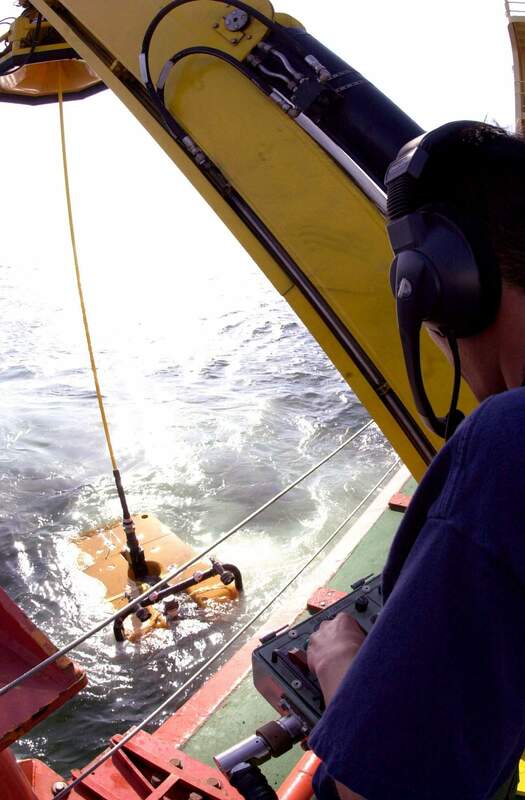 445k Sailors of the Deep Submergence Unit (DSU) Unmanned Vehicles (UMV) Detachment perform routine checks on the Remotely Operated Vehicle Super Scorpio I prior to departing San Diego for the crash site of Alaska Airlines Flight 261. 1 February 2000. USN photo # N-2619S-002 by Photographer's Mate 1st Class Auguest C. Sigur, courtesy of chinfo.navy.mil web site. 186k Sailors work into the night to find the second of two flight recorders from the crash site of Alaska Airlines Flight 261. Super Scorpio, a tethered, unmanned remote vehicle, is brought back aboard the Military Sealift Command special missions Submarine Support ship MV Kellie Chouest. The ship will then relocate so the crew can continue their search within the crash site area. Photo taken on 2 February 2000. USN photo # N-5961C-007 by Photographer’s Mate 1st Class Spike Call, courtesy of chinfo.navy.mil web site. 335k The flight data recorder from Alaska Airlines Flight 261 rests in the mechanical arms of Super Scorpio, a Tethered Unmanned Work Vehicle, aboard MV Kellie Chouest. Super Scorpio is operated by the Navy's Deep Submergence Unit Unmanned Vehicle Detachment. Photo taken on 3 February 2000. USN photo # N-5961C-006 by Photographer's Mate 1st Class Spike Call, courtesy of chinfo.navy.mil web site. 69k Machinist Mate 2nd Class Robert Rodriguez of Amarillo, Tex., (right) pilots the Super Scorpio Unmanned Work Vehicle as it searches the ocean floor Thursday just prior to the recovery of the flight data recorder from Alaska Airlines Flight 261. Machinist Mate 2nd Class Robert Duncan of Torrance, Calif., is the co-pilot and is responsible Super Scorpio's mechanical arms. 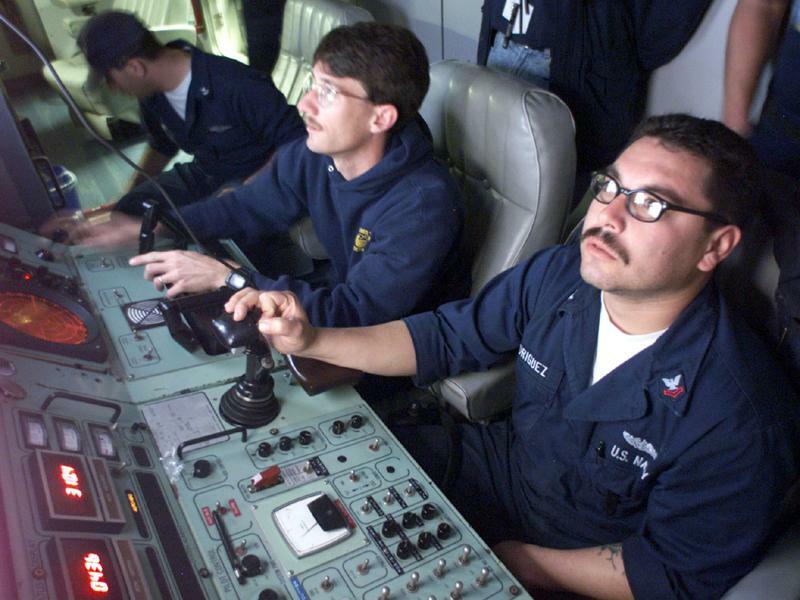 Both men were responsible for the recovery of the first "black box" Wednesday afternoon and are assigned to the Navy's Deep Submergence Unit, Unmanned Vehicles Detachment, Naval Air Station North Island, Calif. Photo taken on 3 February 2000. USN photo # N-5961C-006 by Photographer's Mate 1st Class Spike Call, courtesy of chinfo.navy.mil web site. 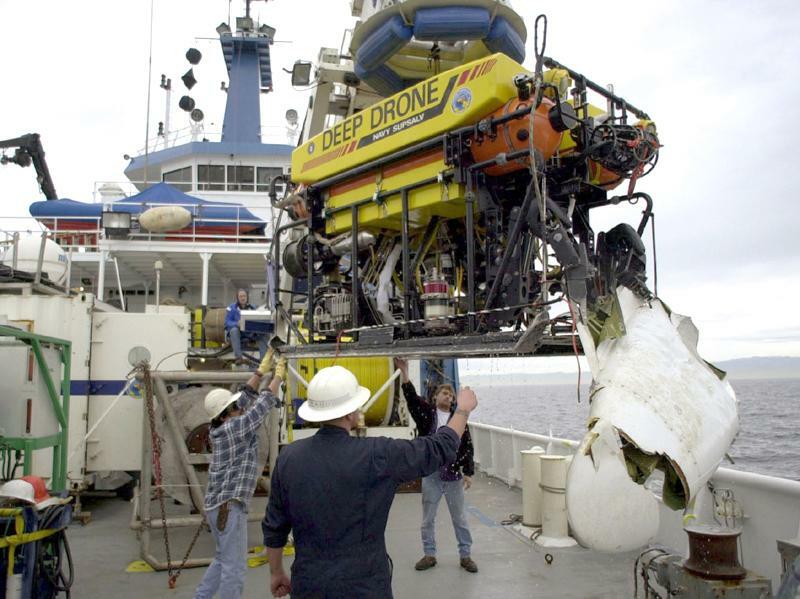 79k The U.S. Navy's Deep Drone Remotely Operated Vehicle recovers a piece of aircraft's fairing from the tail section on the ill fated Alaska Airlines Flight 261. The recovery crew are operating aboard M/V Independence off the southern California coast. Photo taken on 8 February 2000. USN photo # N-5961C-006 by Photographer's Mate 1st Class Spike Call, courtesy of chinfo.navy.mil web site. 262k Aboard Salvor (ARS-52). Scorpio II is lowered into waters off the coast of Hawaii, with the Auxiliary Rescue and Salvage ship Salvor (ARS-52) in the background. 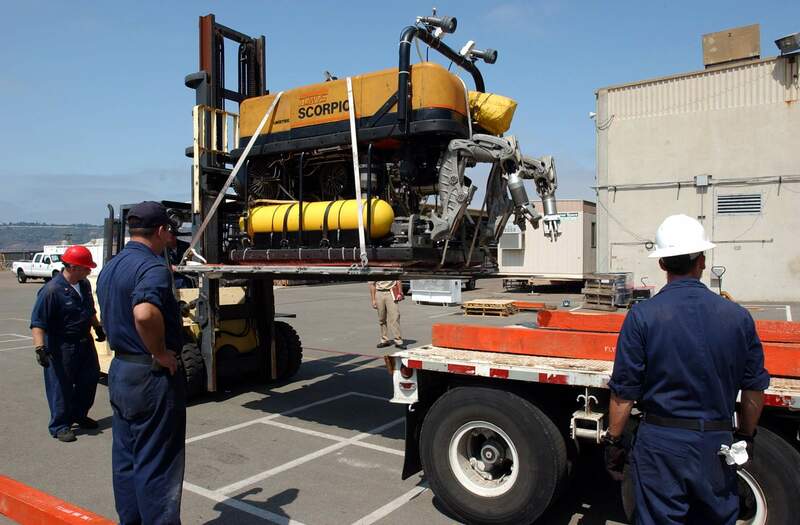 The remotely operated vehicle Scorpio II was flown in from the Navy's Deep Submergence Unit (DSU) in Coronado, Calif. The DSU team and Scorpio II have conducted more than 93 hours of detailed survey operations since the February 9 collision at sea involving Greeneville (SSN-772) and the Japanese fishing vessel Ehime Maru nine miles off the coast from Diamond Head, Hawaii in approximately 2,000 feet of water. USN photo # N-0000P-004 by USN photo by Lt. Cmdr. Flex Plexico, courtesy of chinfo.navy.mil web site. 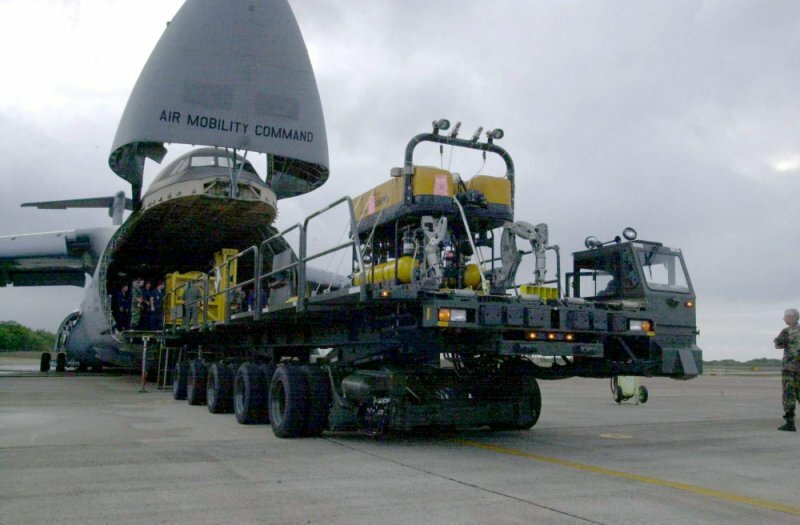 311k In San Diego, Calif., the remotely operated vehicle (ROV) Super Scorpio is loaded into a U. S. Air Force C-5B Galaxy cargo plane bound for Honolulu, Hawaii, on 12 February 2001. 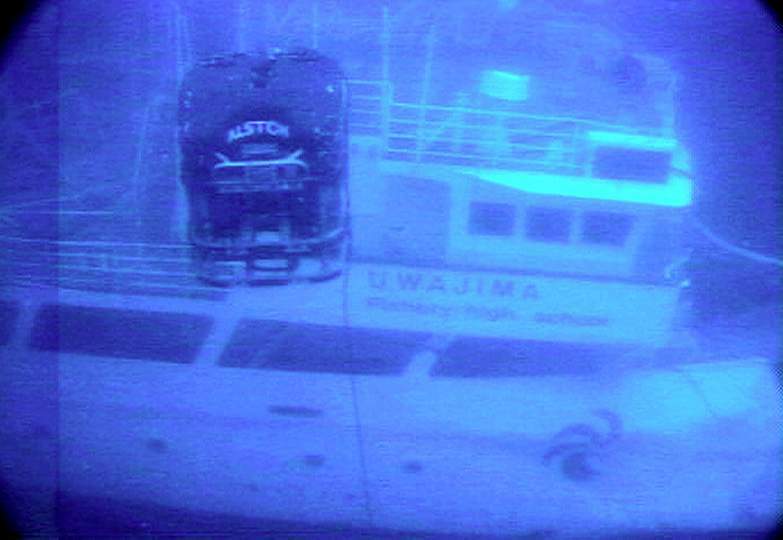 An unmanned vehicle detachment will conduct video surveys of the sunken vessel Ehime Maru. USN photo by Petty Officer 1st Class (AW/SW) Gregory Messier, courtesy of chinfo.navy.mil web site. 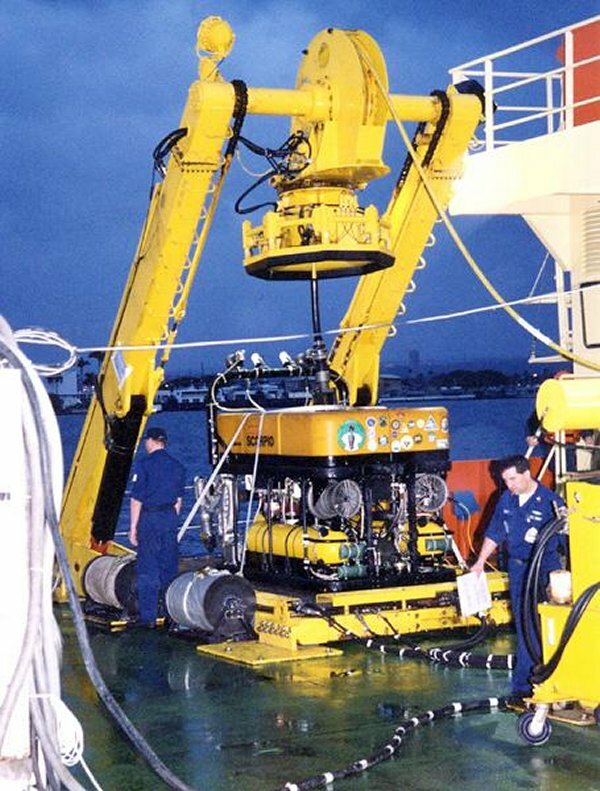 51k Petty Officer 2nd Class Heath Poulter pilots the remotely operated vehicle (ROV) Super Scorpio during an operational test dive in Pearl Harbor, Hawaii, 15 February 2001. Heavy weather is preventing the deployment of Super Scorpio from conducting video surveys of the sunken Japanese fishing vessel Ehime Maru , involved in a tragic February 9 collision at sea with Greeneville (SSN-772). The Japanese vessel sank in 1800 feet of water approximately nine miles off the coast of Diamond Head. USN photo # N-6520M-012 by Photographer's Mate 1st Class Gregory Messier, courtesy of chinfo.navy.mil web site. 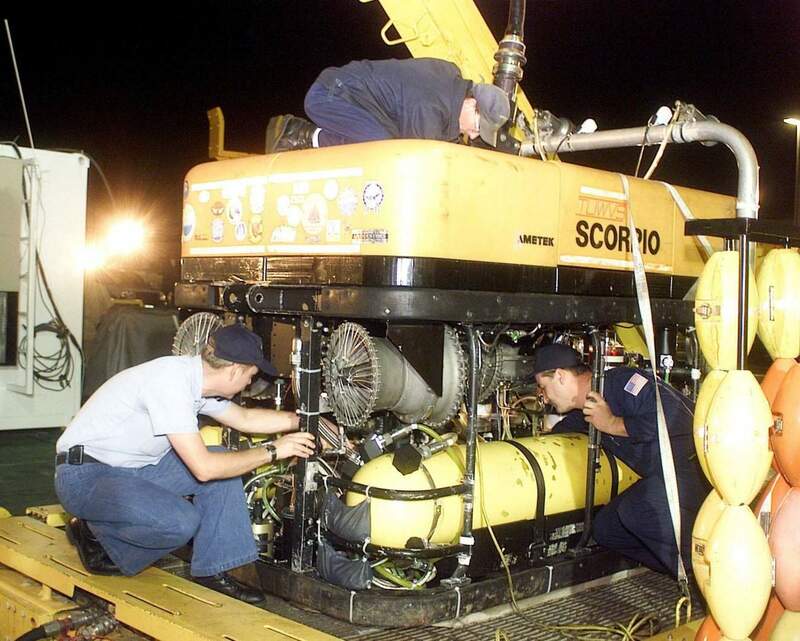 63k Navy personnel ready the remotely operated vehicle (ROV) Super Scorpio at Pearl Harbor on 14 February 2001 following the tragic 9 February collision at sea involving the Japanese fishing vessel Ehime Maru and Greeneville (SSN-772) approximately nine miles off the coast of Diamond Head. USN photo # N-0000X-001 courtesy of chinfo.navy.mil web site. 311k Aboard Salvor (ARS-52). 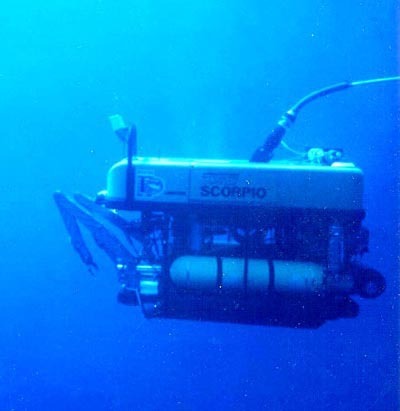 Members of the Deep Submergence Unit lower the remotely operated vehicle Scorpio II into waters off the coast of Hawaii. Video footage taken by Scorpio II will augment video gathered by another remotely operated vehicle, Deep Drone, since the investigation began after the 9 February collision at sea involving Greeneville (SSN-772) and the Japanese fishing vessel Ehime Maru off the coast of Diamond Head, Hawaii, in approximately 2,000 feet of water. USN photo # N-0000P-002 by USN photo by Lt. Cmdr. Flex Plexico, courtesy of chinfo.navy.mil web site. 82k A Sailor from the Deep Submergence Unit (DSU) describes Super Scorpio II operations to members of the Japanese and U.S. media aboard the M/V C-Commando . USN photo # N-0000P-003 by Lt. Cmdr. Flex Plexico, courtesy of chinfo.navy.mil web site. 297k Remote operated vehicle (ROV) Super Scorpio from the Deep Submergence Unit stationed on Naval Air Station North Island, Coronado, Ca. is launched from the Edison Chouest ship C Commando. USN photo by Petty Officer 1st Class (AW/SW) Gregory Messier, courtesy of chinfo.navy.mil web site. 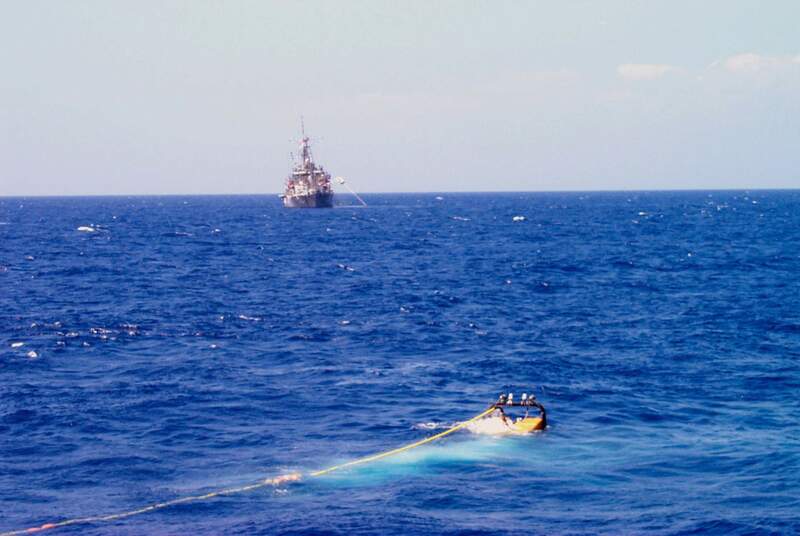 35k The Japanese fishing vessel Ehime Maru is lifted from the ocean floor by the Rockwater 2 to a shallow-water recovery site off the coast of Honolulu on 24 October 2001. 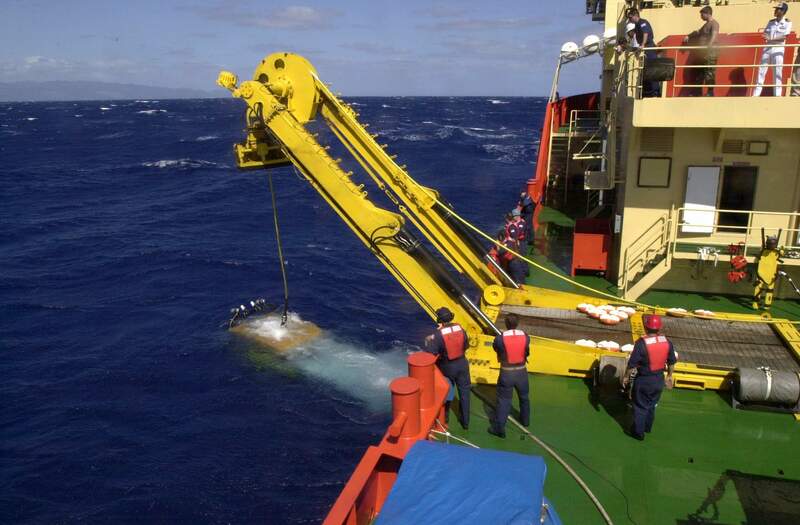 In this photo, the Quest electric work-class remotely operated vehicle (ROV) observes the wreckage. The Ehime Maru went down off the coast of Honolulu, Hawaii, after a collision at sea with the submarine Greeneville (SSN-772) . U.S. Navy photo, courtesy of chinfo.navy.mil web site. 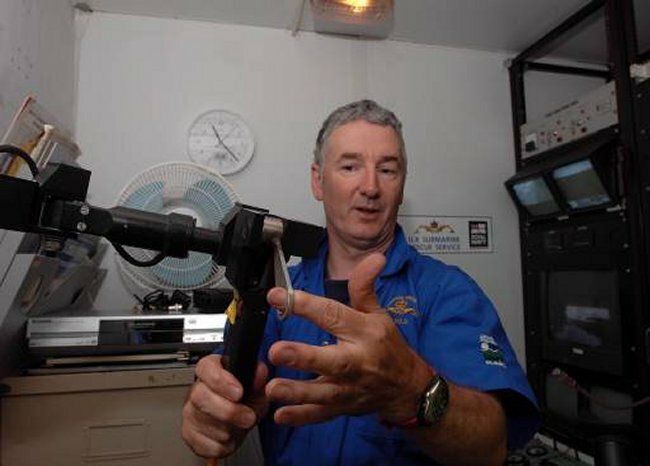 103k Machinist's Mate 1st Class Charles Holter directs the Remotely Operated Vehicle (ROV) Super Scorpio back aboard the submersible support and submarine rescue ship,M/V Delores Chouest during Exercise Sorbet Royal 2002, as two other crew assist. 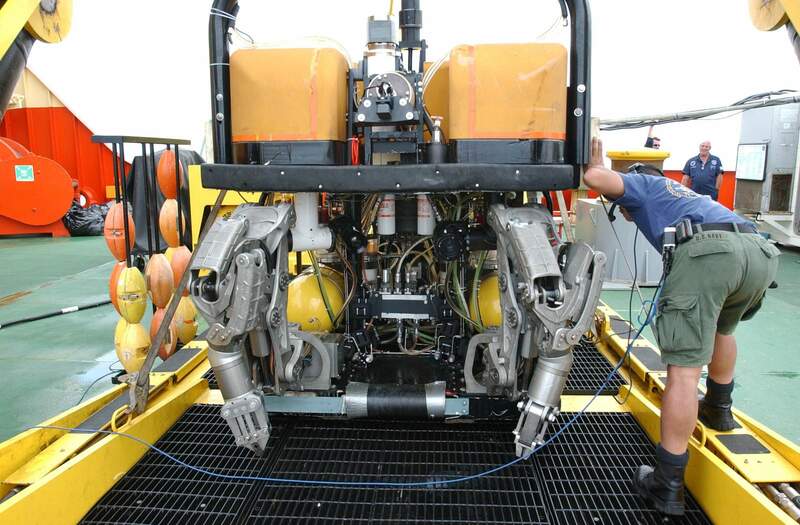 The U.S. Navy has two Super Scorpio's ROVs, each equipped with two heavy-lift hydraulic manipulators: one five-function and one seven-function position-feedback. 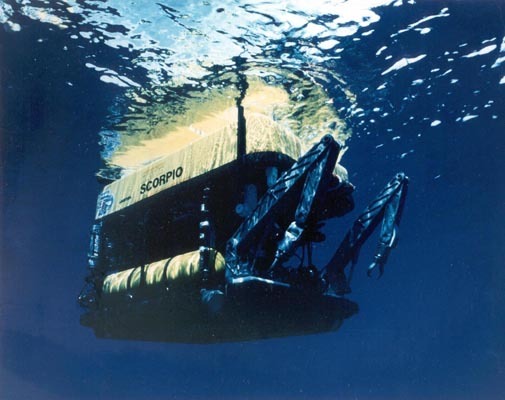 Super Scorpio's have a maximum operating depth of about 5,000 feet (1,524 meters). Sorbet Royal 2002 is the fifth North Atlantic Treaty Organization (NATO) sponsored live submarine search and rescue (SAR) exercise being held off the coast of Denmark, at Frederikshaven, Denmark. USN photo # N-0096V-002, courtesy of chinfo.navy.mil web site. 45k Super Scorpio starboard view, submerged and underway. Courtesy of chinfo.navy.mil web site. 23k Super Scorpio port side view, submerged and underway. Courtesy of chinfo.navy.mil web site. 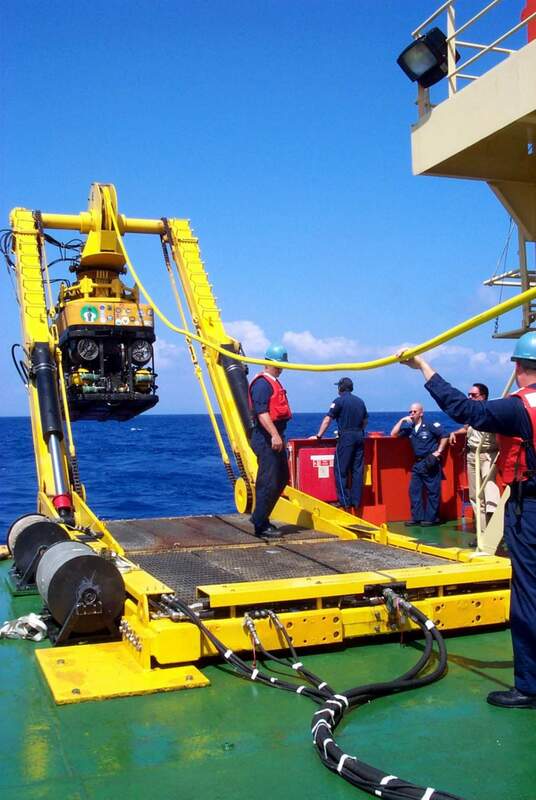 338k Machinist's Mate 3rd Class Derrick Lines guides Super Scorpio , a remote operated vehicle into position for safe recovery aboard the special mission charter ship MV Kellie Chouest on 26 April 2004. Petty Officer Lines is assigned to Deep Submergence Unit Unmanned Vehicle Detachment, tasked with surveying the wreckage of an F-14D Tomcat that crashed off the coast of Point Loma, Calif. MV Kellie Chouest is one of four Submarine Support Vessels belonging to the Military Sealift Command Special Mission Ships Program. USN photo # N-7949W-011 by Photographer's Mate 1st Class Daniel N. Woods, courtesy of chinfo.navy.mil web site. 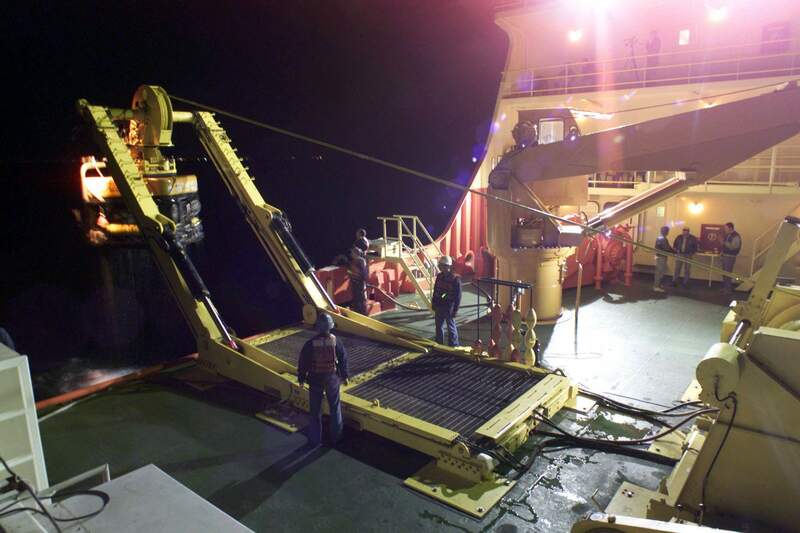 474k Deep Submergence Unit (DSU) Unmanned Vehicle Detachment (UMA Det) personnel guide the Super Scorpio remote operated vehicle (ROV) to a safe recovery aboard the special mission charter ship MV Kellie Chouest. USN photo # N-7949W-007 by Photographer's Mate 1st Class Daniel N. Woods, courtesy of chinfo.navy.mil web site. 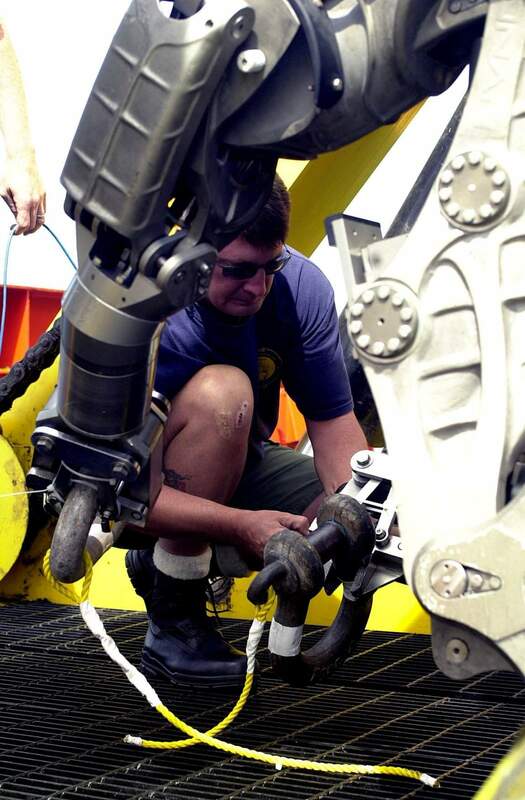 338k Senior Chief Machinist's Mate Christopher McGilvray zip-ties a shackle to one of the manipulator arms on the Super Scorpio remote operated vehicle (ROV) aboard the special mission charter ship MV Kellie Chouest. Senior Chief McGilvray is assigned to Deep Submergence Unit (DSU) Unmanned Vehicle Detachment (UMV Det) tasked with recovering parts of an F-14D Tomcat that crashed off the coast of Point Loma, Calif. USN photo # N-7949W-005 by Photographer's Mate 1st Class Daniel N. Woods, courtesy of chinfo.navy.mil web site. 310k Aboard the Military Sealift Command (MSC) special missions ship MV Kellie Chouest, Sailors assigned to Deep Submergence Unit (DSU) Unmanned Vehicles Detachment (UVD) prepare the Super Scorpio remote operated vehicle (ROV) for a salvage dive on an F-14D Tomcat 200 feet beneath the Pacific ocean on 6 May 2004. The F-14D Tomcat assigned to the "Tomcatters" of Fighter Squadron Thirty One (VF-31), crashed into the ocean approximately two miles west of Point Loma, Calif., during a routine training mission from John C. Stennis (CVN-74) after experiencing engine trouble. The aircraft was diverted to land at Naval Air Station North Island, but crashed while trying to reach the air station. USN photo # C-4633P-001 by Geoffrey Patrick, courtesy of chinfo.navy.mil web site. 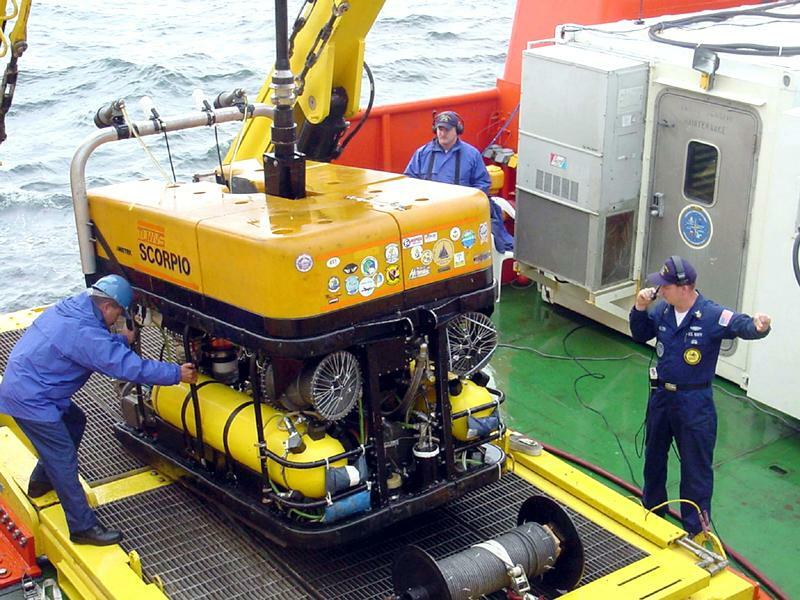 295k A Sailor inspects the Super Scorpio remote operated vehicle (ROV), equipped with remotely operated video cameras and robotic manipulators aboard the Military Sealift Command (MSC) special missions ship MV Kellie Chouest on 7 May 2004. USN photo # C-4633P-001 by Geoffrey Patrick, courtesy of chinfo.navy.mil web site. 44k Stewart Gold, the Supervisor for the Remotely Operated Vehicle (ROV) Scorpio, explains the operation of the manipulator for Scorpio's arms. It provides 9 functions of movement, and is aboard the Finnish icebreaker MSV Fennica in support of the NATO submarine escape and rescue exercise Sorbet Royal 2005 on 20 June 2005. Gold is with the Remote Underwater Maintenance and Inspection Consultants (RUMIC) for James Fisher Defence. Divers from various nations will work together to rescue the submariners during the exercise in the Mediterranean off the coast of Taranto, Italy from 17-30 June 2005. Sorbet Royal 2005 is the largest and most challenging live submarine escape and rescue exercise ever conducted. Participating nations will test their capabilities and interoperability with 27 participating nations (including 14 NATO nations, Russia, Ukraine and Israel). Four submarines will be placed on the bottom (each with up to 52 men aboard) while rescue forces with a range of sophisticated rescue vehicles and systems work together to solve complex disaster rescue problems in a variety of difficult scenarios. USN photo # N-0000P-004 by USN photo by Chief Journalist (SW/AW) Dave Fliesen, courtesy of sorbetroyal2005.net. 371k Sailors assigned to the U.S. Navy's Deep Submergence Unit, Naval Base Coronado, make preparations to load Super Scorpio, a robotic rescue vehicle aboard an Air Force C-5 Galaxy aircraft at Naval Air Station North Island, San Diego, Calif. August 5, 2005. The Navy is transporting two of the remotely operated vehicles in an effort to assist the rescue of seven Russian Sailors trapped on the ocean floor in a mini-submarine off the Kamchatka Peninsula. 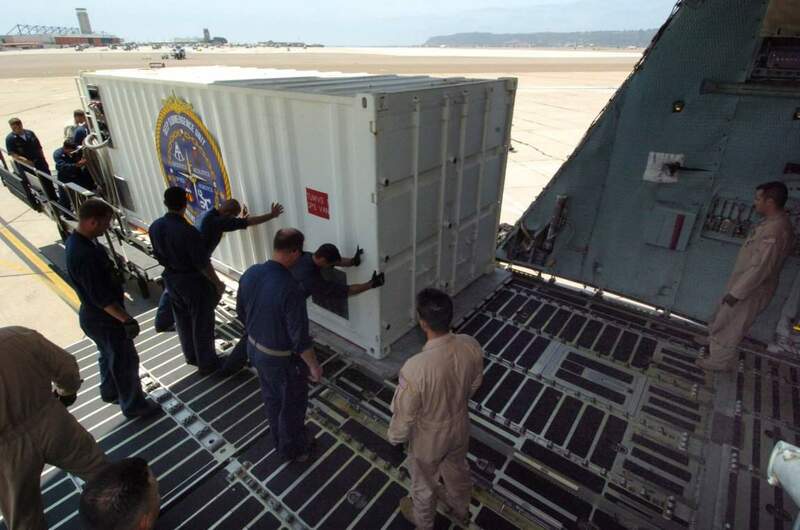 The Super Scorpio and a team of U.S. Navy technicians are to be flown from San Diego to Petropavolvsk, and then transported by truck to be embarked on a Russian ship before making a descent to the stranded submarine. USN photo # N-8629M-102 by Photographer's Mate 3rd Class Rebecca J. Moat, courtesy of navy.news.mil. 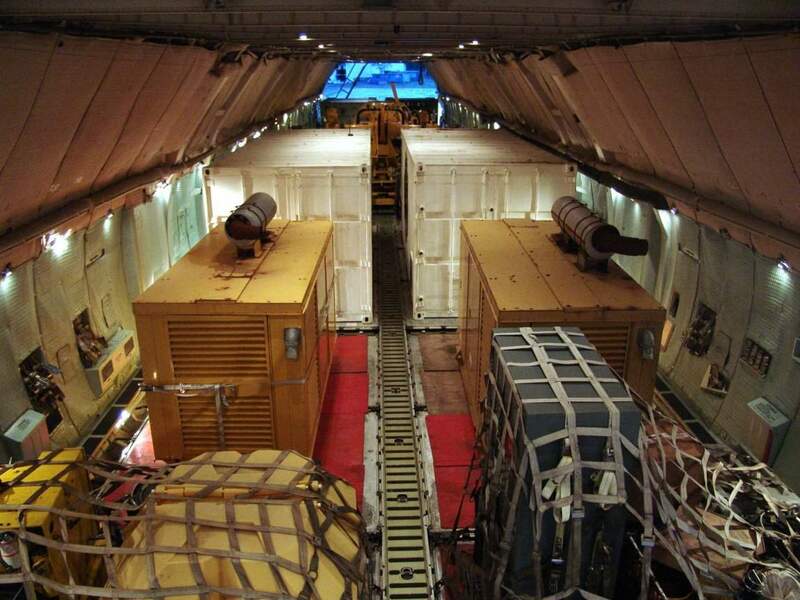 206k Pallets of gear and other supplies necessary to provide assistance to the trapped, Russian mini-submarine Priz were loaded aboard an Air Force C-5B Galaxy aircraft. 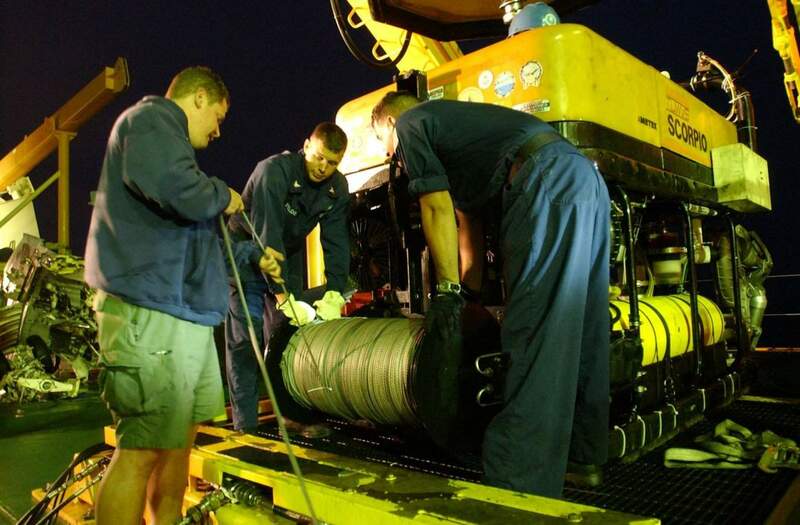 The Navy deployed a team of 30 Sailors from Deep Submergence Unit (DSU) based at Naval Air Station, North Island as well as two Super Scorpio remotely operated vehicles (ROV) to rescue the mini-submarine's crew of seven. DSU has Deep Submergence Rescue Vehicle Mystic(DSRV-1) and a variety of unmanned ROVs and Submarine Rescue Chambers (SRCs). 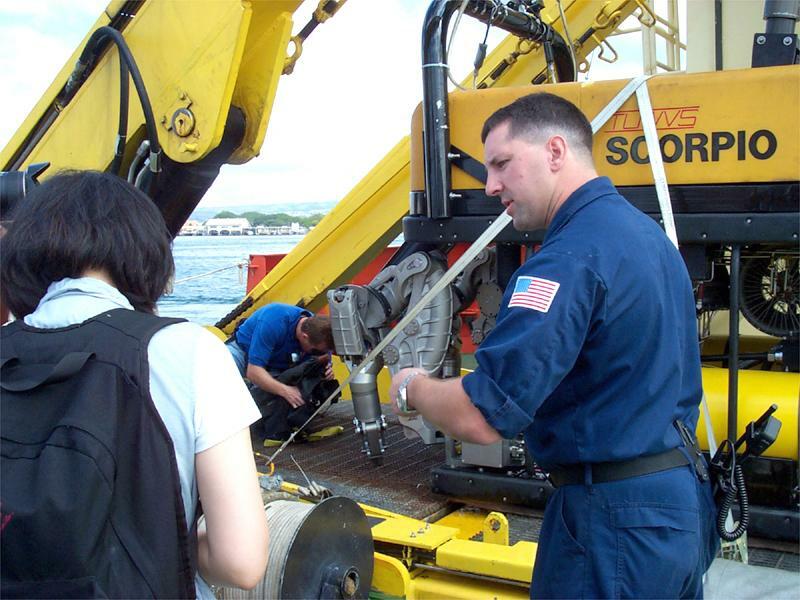 DSU’s mission includes deep ocean research and recovery and scientific research as well as worldwide submarine rescue. USN photo # N-7949W-002 by Photographer's Mate 1st Class Daniel N. Woods, courtesy of navy.news.mil. 249k Sailors assigned to the U.S. Navy's Tethered Underwater Vehicle System (TUWVS) Detachment, located at Naval Air Station North Island, make preparations to load Super Scorpio a robotic rescue vehicle aboard an Air Force C-5 Galaxy aircraft at San Diego, Calif., 5 August 2005. USN photo # N-4633P-002 by Mr. Geoffrey Patrick, courtesy of navy.news.mil. 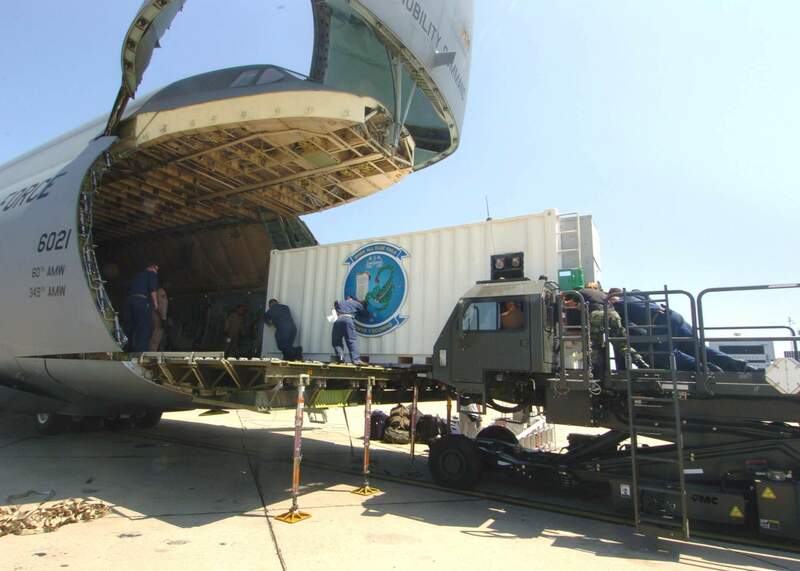 438k U.S. Navy's Deep Submergence Unit equipment is loaded onto a U.S. Air Force C-5 Galaxy transport aircraft prior to being flown to Petropovlosk, Russia 7 August 2005 as part of the rescue mission of the Russian mini-submarine Priz. The Navy transported two Super Scorpio remotely operated vehicles in an effort to assist the rescue of seven Russian Sailors trapped on the ocean floor in a mini-submarine off the Kamchatka Peninsula. USN photo N-1126G-011 by STS2/SS Sean Azpeitia, courtesy of navy.news.mil. 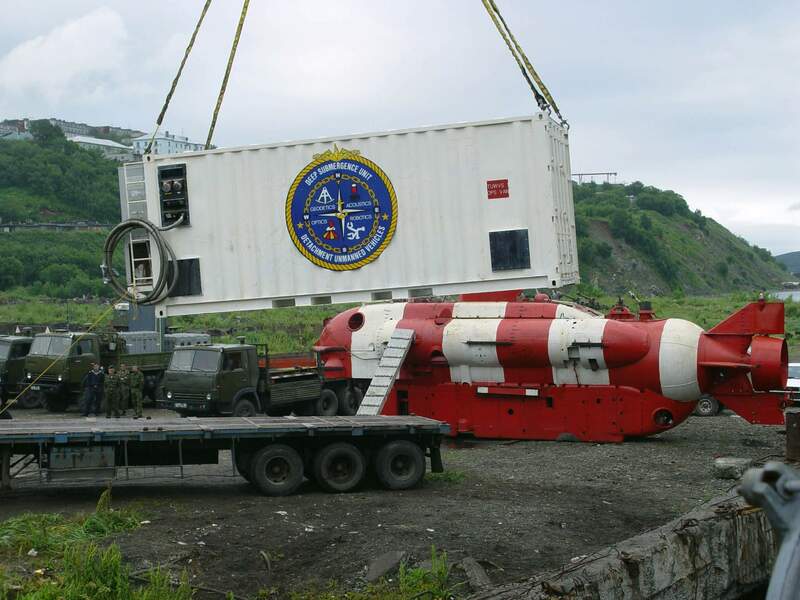 298k The remote operated vehicle control center of U.S. Navy's Deep Submergence Unit is loaded onto a Russian ship in Petropovlosk, Russia as part of the rescue mission of the Russian mini-submarine Priz. USN photo # N-1126G-003 by STS2/SS Sean Azpeitia, courtesy of navy.news.mil. 2.05k Six photo PDF of various scenes of Super Scorpio. Photos by STS2/SS Sean Azpeitia. There is no DANFS History currently available for Super Scorpio at the Haze Gray & Underway Web Site, the main archive for the DANFS Online Project. Naval Technology-LRS Submarine Rescue Systems-Submersible Rescue Vehicle. ©1996 - 2019, NavSource History All rights reserved.